Note: This interview took place in Japan in June 2008 during the development phase of Jam with the Band. I’d like to ask something first, if I may. I was wondering why this session of ‘Iwata Asks’ is taking place, given that Jam with the Band is a title for the Nintendo DS*. *Note: Iwata Asks: Jam with the Band was the first Iwata Asks interview to be published on the Japanese Nintendo website featuring a Nintendo DS game. This version of Jam with the Band uses new systems that haven’t been seen in music games up to now. I didn’t think we could communicate these new systems in a 15-30 second TV commercial, so I thought it would be better to introduce points of these systems to everyone by talking directly to three people who were responsible for their development. It’s the first time we’ve done this for a Nintendo DS title! I also have an interesting personal connection with this software… Anyway, please begin by introducing yourselves. I’m Kitamura from Software Development & Design Department. I was the art director on Daigasso! Band Brothers1, and I’m the director on this title. I’m only the director in name, though. 1Daigasso! Band Brothers is a piece of music software that was a launch release for the Nintendo DS. It was released in Japan in December 2004. Commonly referred to as Band Brothers, it was the predecessor to Jam with the Band, and was never released outside Japan. Our team wasn’t divided into groups like ‘designers’ or ‘programmers’. Every staff member contributed ideas that went into the making of this title. But people usually say that’s a terrible way to get things done! (laughs) Many people say that a majority-rule based system often functions badly in the creative world, and that the best way to complete a project is for one person with a clear vision to act as a leader for the staff to follow and unite behind. Why did you choose to take the opposite approach? Every staff member had an image of what the completed Jam with the Band would look like. Moreover, this image was something we all shared from the very first step of the development process. As a result of this, we thought we could make a more interesting software title if we all gathered together and shared ideas. I got the impression that everyone in the team was very connected with each other, and it might have something to do with what you have just explained. Okay, now it’s your turn, Kitahara-san. I’m Kitahara from Software Development & Design Department. I joined the Band Brothers development project when it was originally planned for the Game Boy Advance during the second half of the entire development process. I was a programmer on Band Brothers, and I’m the program director for this title. I examine the specifications, and consider whether it would be possible to implement them in the software. I also communicate the specifications to the other programmers, so I have mainly liaison duties. We’ll talk some more about the Game Boy version later on. Now, our final introduction please, Kyuma-san. 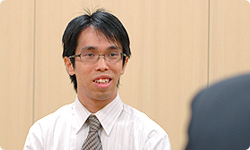 I’m Kyuma from Software Planning & Development Department. I was appointed to be sound director on the project team. My main tasks involve assembling the music data and giving my opinions on how we can make the software easier to use from an audio point of view. You joined this company at the same time, didn’t you, Kyuma-san and Kitahara-san? 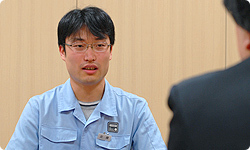 Kitahara-san touched on a fraction of this game’s history in his previous comment, but planning for Band Brothers actually started during the Game Boy Color2 era. How long have you been involved with Band Brothers, Kitamura-san? 2The Game Boy Color was a portable game device with a colour screen. A successor to the original Game Boy, it was released in October 1998. (laughs) From back when it was originally called Game Boy Music, Band Brothers came a long way and went through many changes before it saw the light of day. Could you tell us a little bit of the Band Brothers history, before it was released onto the world? I’ll be talking for an hour or two if I start telling that story – and I still won’t be finished! (laughs) The story really is that long, and it’s full of twists and turns, so I’ll give you a summary. It all started when I drew a new character. You’re talking about Barbara, the main character, right? Your main job originally was designing instruction manuals and packaging (artwork designs), wasn’t it, Kitamura-san? Yes. I came up with Barbara during my free time at work. After I designed her though, I was stuck in a period where I kept wondering if someone was going to use her in a game. I had to just sit tight and wait to be contacted. And no-one wanted to use Barbara in a game? The music in the Game Boy Color era was all plinky-plonk electronic music, wasn’t it? So that was when you started developing Band Brothers’s predecessor, Game Boy Music. But while we were making slow progress with that, the Game Boy Advance3 was developed, and we realised that it would offer us better sound quality. 3The Game Boy Advance was a successor to the Game Boy Color that allowed 4-player network play. It was released in March 2001. You could now produce natural sounds without having to borrow a special sound chip. However, the development of Game Boy Music had to be abandoned just before its completion. We had various problems, but the main issue was the fact that for Jam Sessions (to play together in a group), every user had to buy their own copy of the software. Playing in the Jam Sessions is a lot of fun, and I really liked watching when multiple players were doing it, but the fact you couldn’t enjoy the Jam Sessions without every user buying a copy of the game made things very awkward. But even though development was cancelled, you didn’t give up on the project, did you? No, I didn’t. I still had my main job as a designer, and although I once gave up the project in tears, I never stopped thinking that I wanted everyone to enjoy Jam Sessions together, whatever it took. And you weren’t the only one who felt that way. At the beginning of 2004, the year the Nintendo DS was released, I had the opportunity to meet Nintendo developers individually. I could feel how strongly all those who had worked on Game Boy Music shared the desire to release the software. Another incident that had occurred before development was cancelled also left a deep impression on me. I remember watching a video of staff members playing the game during its development. After they’d finished playing a song, they would all celebrate by high-fiving each other. People don’t normally high-five each other after playing a game, do they? No, indeed. After witnessing that, I really felt: “There’s something special about this software”. It was around the time that we’d started developing software for the Nintendo DS. That’s when we realised that, using the wireless communications feature of the Nintendo DS, users could play Jam Sessions together with only one copy of the software. At a stroke, the arrival of the Nintendo DS had solved what had seemed like an insurmountable hurdle on the Game Boy Advance. As a result, we hastily reassembled the project team. It was a project that had lost its way repeatedly ever since its origins in the Game Boy Color era. I imposed that condition because I didn’t want to allow enough time for it to lose its way again. At first, everyone was worried about the time restrictions, but as soon as the Jam Session feature started working, the atmosphere within the team completely changed. I remember that everyone was playing Jam Sessions whenever they had a minute to spare. We always really wanted to play Jam Sessions, but there was no time left for development. We were torn, but in the end we inevitably got together and played, every evening. And even though there was no time left for development, I made a couple of new requests regarding the content of the software, didn’t I? Iwata-san persuaded us, saying: “Even if there’s only one person in a class that can make music, their classmates would be really happy to receive a song that they wrote”. 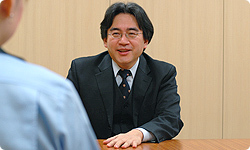 But when we made a prototype version and showed it to you, Iwata-san, you said: “That’s no good”. It was devastating. While we were trying out various things, Iwata-san was writing a list of specifications himself. It’s the only list of specifications I’ve written since I became Company President. I felt I had a lot of responsibility as well, after announcing: “I’m cancelling development unless this software is a Nintendo DS launch title”, so I got involved rather inadvertently. You really helped us out at that time. 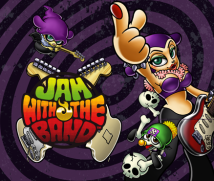 Your specifications were easy to understand, and we’ve carried them over to this latest software, Jam with the Band. I’m really glad that we added the Studio mode. You said you couldn’t read music, Kitamura-san, but by the latter stages of the project you were buying commercial sheet music and effortlessly making songs. After the software was released, a number of Band Brothers “artists” have appeared, and we’ve seen people writing on their blogs: “I’ve made this song - everyone should listen to it!”. Several problems did become apparent as well, however. Only eight songs you’d made could be saved in Studio mode, so there were a lot of calls for us to make it possible to save more songs. We also released an “Extra Song Game Cartridge”4, but we soon realised that users’ musical tastes vary greatly. Some people felt that the songs leaned too much towards one genre or another. So when we started talking about making the next game, I thought: “This time we can create something that satisfies every user”, an idea which made me really happy. 4The “Extra Song Game Cartridge” was a Game Boy Advance-type software cartridge that added new songs to “Daigasso! Band Brothers”. The list of songs compiled was based on a user survey, and the cartridge was sold online.